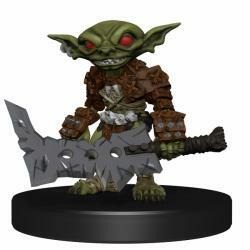 In August, WizKids will release the Pathfinder Battles: Legendary Adventures Preview Pack, a set of pre-painted plastic miniatures for the Pathfinder 2nd Edition, followed by the launch of the larger Legendary Adventures series and a Goblin Village Premium Set, both set for September. The Pathfinder Battles: Legendary Adventures series will feature miniatures based on concept art Paizo Publishing has prepared for the new edition of its flagship fantasy role playing game, which was previewed last year as the Pathfinder Playtest (see “Paizo Kicks Off ‘Pathfinder 2E’”). The Legendary Adventures Preview Pack will include eight newly-sculpted pre-painted miniatures, including a pair of Goblins, two Orcs, a Bugbear, and a Hobgoblin plus an armored Elf warrior and a Halfling slinger.